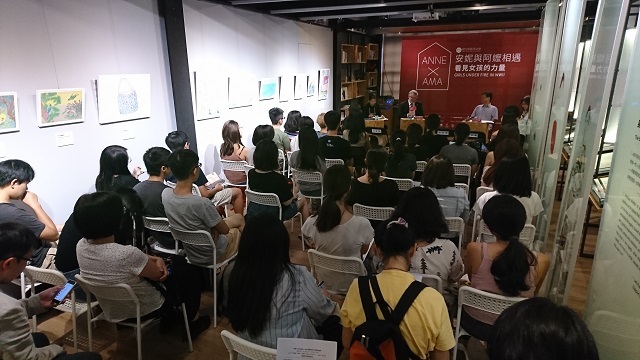 On July 7, cooperating with Taipei Women’s Rescue Foundation, the famous Dutch peace organization – Anne Frank House – held a very special exhibition called “Anna X Ama, Girls Under Fire in WWII” at Taipei. The exhibition will be held till 30th December, 2018. This is a exhibition, combining footage, documents, and the world-wide known witness manuscript of Anne Frank: The Diary of A Young Girl, intending to lead the audience to reflect the meanings of human rights, discrimination, war, transitional justice and etc, through a special encounter between Anne and Ama(meaning grandma in Taiwanese, also a symbol suggesting those Asian comfort women sexually exploited by the Japanese military troops during WWII). 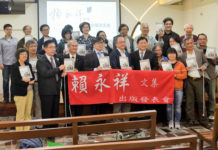 In the opening ceremony of this exhibition, Mr Martin Eberts, Director General of the German Institute Taipei, praised this event carrying a very positive message for contemporary young generation. 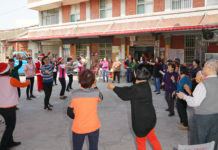 Especially, through a presentation of the courage and perseverance of those most vulnerable people, children and women, suffering in the persecution, discrimination and kinds of exploitation and evils, the cruelty of the war and an hideous genocide like Holocaust to murder millions of Jewish people would never happen again, said Mr Eberts. Mr Andre Verkade, Deputy Representative of the Netherlands Trade and Investment Office, expressed that people could see both the ugliness of war and the beauty of mercy and courage through this special exhibition combining the book of Anne Frank: The Diary of A Young Girl and its detailed pictures and files offered by Anne Frank House located in Amsterdam, Holland.